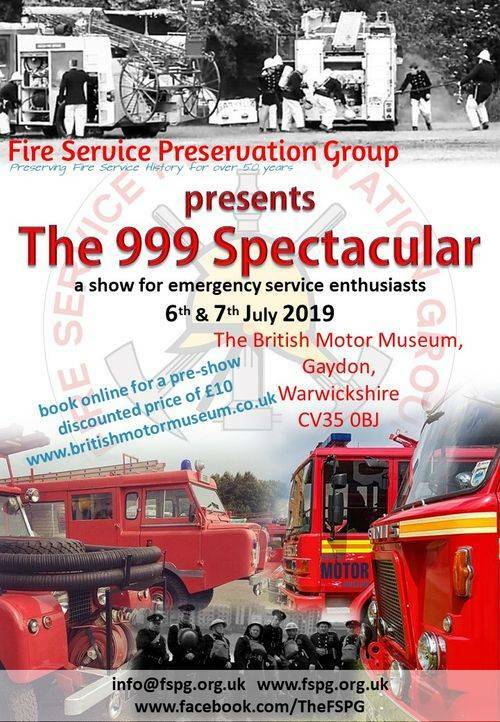 The FSPG is returning to The British Motor Museum, Gaydon on the 6th & 7th July 2019 for the 999 Spectacular. The show, will bring together preserved Ambulances and Police vehicles alongside their fire service counterparts. Advanced tickets will be available via www.britishmotormuseum.co.uk shortly at a discounted rate of £10.00 (Usually £14.50) which will also allow entry to the museum and the BMC/Leyland show that is also happening that weekend. FSPG members can enjoy an afternoon of training and drills, ideal for the younger and newer members, we also hope to have specialist equipment available that members will rarely get the opportunity to train with. Firefighting through the ages displays will take place place on the 7th July with all the bangs and smoke of the traditional fire show. The FSPG was founded in London in 1968, and called at that time The Auxiliary and National Fire Service Preservation Group. The purpose was to preserve the equipment and appliances of the National and Auxillary fire services after their disbandment. The present title was adopted in 1972, and with this change the group widened its aims to include all aspects of fire service preservation and interests. Members of "the group" come from all walks of life, many of whom are former or serving firefighters and ages vary, from new born to well into retirement. Applications for membership are invited from individuals or families with interest in the fire services, their appliances or equipment, or the actual restoration and preservation of fire appliances. Whilst some members own and operate appliances, others are interested in modelling, producing models from kits or in many cases from scratch. Others collect helmets, badges, uniform, die-cast models or photographs. In fact anything which is of interest, but for some just being a member brings its own rewards.